DES MOINES, Iowa — Charles Matthews had 22 points and 10 rebounds in his best performance since coming back from injury, and No. 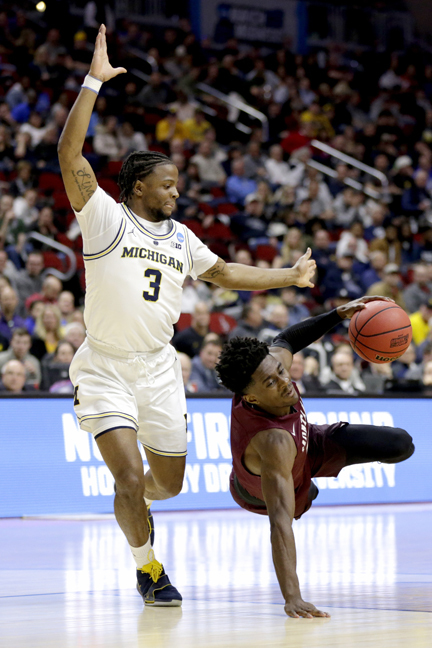 2 seed Michigan put away Montana early in a 74-55 victory in the first round of the NCAA Tournament on Thursday night. Montana: The Grizzlies were missing 6-foot-8, 253-pound redshirt senior forward Jamar Akoh once again because of a knee injury. Not that it would have made much difference, but they could have used him against the 7-1, 260-pound Teske and Michigan’s other bigs. As it is, they won 15 of their last 18 games and played in the tournament for the second straight year and fifth time in 10 years. Michigan: The Wolverines put their disappointing loss to Michigan State in the Big Ten Tournament title game in their rearview mirror with an easy win over the Grizzlies. Now it’s on to what figures to be a challenging game against a defensive-oriented No. 10 seed in Florida. The Wolverines beat the Gators in the Elite Eight on their way to the 2013 national championship game.